Most players will say building a table image is extremely important to your long-term success at a table. And I agree with that in general terms. However, I have found myself getting caught by people not respecting the table image I built up over the course of ten or so orbits. After thinking about it for quite some time, I think I know what’s going on. The first aspect of my problem is playing at tables where players aren’t good enough to learn your table image. What I mean by that is a lot of players simply aren’t good enough to pick up on someone’s table image at all. If there are players at your table who aren’t good enough to track it or aren’t using a HUD to track it then building a table image is not going to help you in the long run. Secondly is the possibility that even good players who can track table image can’t track it for all 8 opponents at the table. It’s hard to do and even good players can’t pull it off, although they are more likely to use a HUD to track that sort of thing. So, think twice before trying to take advantage of a TAG table image, for example, by bluffing a missed flop because you have to ask yourself if the people at your table are good enough to know you’re playing TAG. Another reason is you have to pay attention to new players joining the table. If you’ve spent quite a while building one table image, that new person who just sat down will have no idea that’s how you’re playing, even if they are experts at tracking table image. You can’t expect to be able to abuse table image against someone who just sat down at the table. Or against a new table in a tournament for that matter. I’ve fallen into a trap of building a strong table image in a tournament at one table only to be moved to a new table once I thought I could start taking advantage of it and being sat down with a bunch of players who have no idea I’ve built an image over the last 4 rounds. That being said, table image is ultimately important when playing heads up or against 2 other opponents. When playing at a table that small even poor players can sometimes pick up on your table image let alone halfway decent players. Heads up is a situation where you can almost always build a table image and then abuse it later on. I think you said it all. In my opinion creating a table image is more important for cash games than tournaments. In most tourneys, I don't go into depths analyzing opponents table image because in the next hand he may be busted or change tables and there are not that many hands to have a strong read. Also having new players constantly coming to the table you just cant analyze everyone. And while there are many who will check their opponent numbers, there are also many who don't have a HUD. Having to profile 8 players is a lot of effort really. 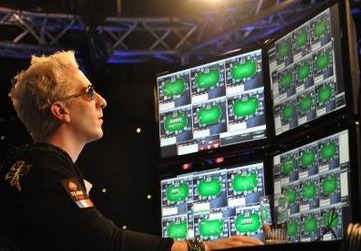 On the other hand, when on a final table many put the effort to analyze every move. And as the number of opponents drop, the profiling of opponents rise. Those situation are where creating and exploiting your table image is at its best. When everyone track your table image. Playing heads up, even bad players who just play their hands notice your image. Basically, I agree with what you're saying. You may scream "I am a nitty rock" at the top of your lungs all you want but make sure that you are not doing that to deaf people. I think, some people even like to or try to bad beat the others with a tight table image. I agree with Whiskers that players will try to "crack aces" against a very tight player. It makes it easier to for them to put a rock on AK, QQ or better and play accordingly with small pairs and suited connectors. I think as a tight player gets more experience they should open their range to be more effective in tournaments. Image is overrated. People just play their own cards and don't even pay attention to what you're doing. For example on my own playing habits. I'm playing online due to the convenience factor. I have 1-4 kids in the house at any given time. I get up for coffee or food or bathroom breaks. I watch movies, fold clothes, even work out. So yes I'm totally watching your table imagine, NOT! Sometimes players are multi tabling 4 to 40 lol tables do you think these guys care about table image just clicking in time is what counts to these guys good luck. Some great points are made here, thanks for posting this. A lot of players just don't pay attention to your table image. You can fold to the Big blind a dozen times, but you try and steal one time and he's calling with crap, go figure. Sometimes it's useful to show your hands to try and reinforce an image your trying to project. Sometimes it actually works, it depends on the table as you say. The problem in what you've said is not trying to use your table image. That is a good thing when used corectly. After playing your game, and they see it, get positioning around the bubble when they're all walking on eggshells and take the worst 2 cards and go all in but leave 1 chip in your stack. When they fold around you, show em. They won't ever forget that. Then go back to playing smart. Exactly- most people aren't paying attention to your table image, especially at low stakes. Live small stakes tourneys I think it takes several games for the people that care to know your image. Online it takes a lot more because most people are multi-tabling. Also, some people just play their cards or their own style regardless of anything else. Some just mash buttons. In micro stakes worry more about your opponents play style. If you have noticed another player with an appropriate fold button, that's likely the only other person at the table that will have noticed the way you are playing, and the only one you can change up your play against to get a situational advantage. The adage, "To a man with a hammer, every problem looks like a nail." may apply. Everyone needs to be aware of the concept first before applying it appropriately. Like another poster, I also don't have the time to determine player patterns when I am juggling 5 other activities or multi-tabling. During the initial to middle portion of a game, if I haven't noticed changes regarding "who is playing what and against who" then I just play loose. If I have paid major money to be in a game, then I try to be sensitive to what's taking place during every hand. Always believe and trust what poker players tell you...especially at the tables. Regarding low-stakes play, when you lose your bankroll and begin working your way up through free rolls and 1/2 cent games, you should be very aware of sloppy play and bingo poker and play accordingly otherwise you may develop a case of Tourette's and remain broke. Try playing against bots or maybe computer chess/GO. If you can establish and exploit programming weaknesses then you should look at NLP and merge the two.